Your Docebo LMS is compatible with SCORM versions 1.2 and 2004 3rd Edition. Access the Admin Menu by scrolling your mouse over the gears icon in the left sidebar. Then, in the E-Learning section, select the Courses item. To upload a SCORM package in Docebo, select a previously created course from the list of courses on the Main Courses page. Make sure you are subscribed to the course as a Superadmin or Instructor. Press the menu icon in the course’s row, then select Training Material from the dropdown menu. Once you have opened the Training Materials page, select the ADD TRAINING MATERIAL button, then select SCORM from the dropdown menu. 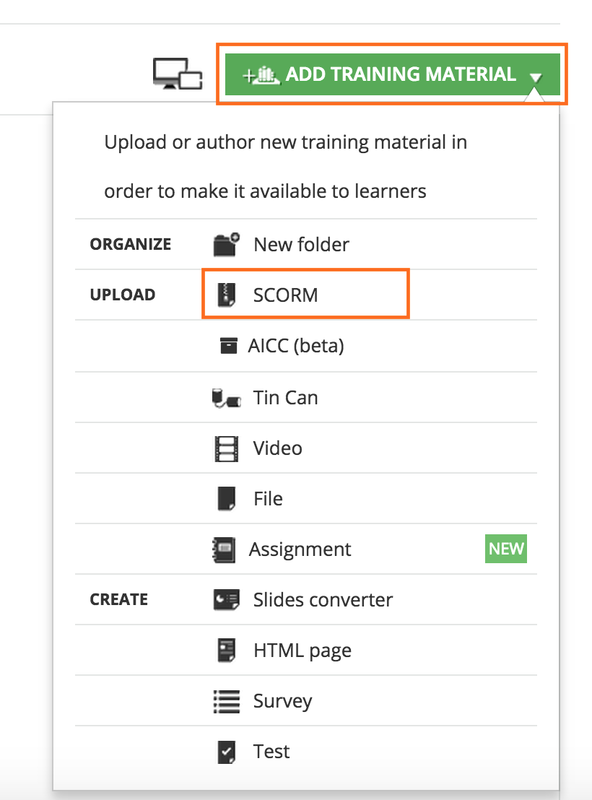 On the following page, select UPLOAD FILE to choose the SCORM file from your computer. You can also set and modify the launch modality of the learning object. New window opens the object in a new window or new tab in your browser (depending on your browser settings). If you plan to also run this object with a tablet device or smartphone using Docebo’s Mobile App, you can also choose how users will view the material. Please note that in order for the SCORM objects to play correctly on your mobile devices, they should be produced and exported with the latest version of the authoring tool you’re using. This is to avoid display errors or glitches related to unpatched versions of the tool. Once the object has been uploaded, confirm by selecting SAVE CHANGES. If the file format is correct, the SCORM object will be uploaded as new course material, and a message will be displayed on the top left of the page. The SCORM package object is now course content, and is ready to be displayed.